If you have silk scarves balled up in your underwear drawer, winter scarves spilling out of your closet and summer scarves hanging on just about every hook, doorknob and doohickey in your bedroom, congratulations: You’re a class five scarf hoarder. To make space for your new stash without getting rid of your old ones, there’s only one remedy — to DIY morning, noon and night. So round up your scarves, roll up your sleeves and get cracking, sister. We’ve got work to do. From framed wall art to silk pajama shorts, here are 15 scarf ideas to get the ball rolling. 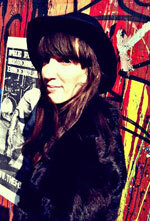 Maria Denardo is the Fashion Director at theFashionSpot. Prior to joining tFS, she worked as the Site Director at Lifestyle Mirror and the Senior Fashion Editor at Fashion Week Daily. Her "unhealthy attachment" to hats led her to the halls of FIT, where she's currently completing her millinery certification. She proves that turbans never, ever go out of style.